President Moon Jae-in on Tuesday ratified September’s Pyongyang Joint Declaration and inter-Korean military agreement reached at the third summit between him and North Korean leader Kim Jong-un in Pyongyang, after the deliberation and resolution of the Cabinet meeting. As a result, Pyongyang Joint Declaration will have legal effect after it is published in the government gazette for public notice soon. The president’s ratification of Pyongyang Joint Declaration and the military agreement following the Cabinet’s deliberation and approval shows the government’s strong willingness to carry out what they can do independently amid concerns that the second U.S.-North Korea summit may be delayed. It indicates that the South Korean government is willing to create an environment necessary for peace settlement on the Korean Peninsula and to strongly promote the North’s denuclearization. However, lawmakers clashed over the Cabinet’s approval of Pyongyang Joint Declaration prior to parliamentary ratification of April’s Panmunjom Declaration clinched between the two Koreas, as the former is a follow-up implementation document for the latter declaration. Whether the implementation of the inter-Korean agreement will proceed smoothly according to Moon’s will, remains to be seen. 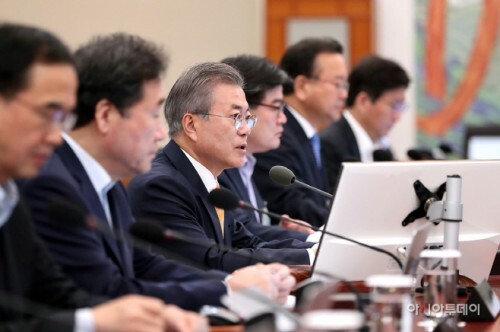 “The improved inter-Korean relations and the eased military tensions will make complete denuclearization of the Korean Peninsula easier, and serve as the facilitator of denuclearization,” Moon said during the cabinet meeting. “It is not only a way to protect the lives of our people and secure their safety, but it will also benefit our economy by removing risk factors from the Korean Peninsula,” the president said. “Above all, it will be beneficial to people living near the border, and it is also a way to substantially improve the human rights of North Korean people,” Moon said. The president urged concerned ministries to ensure that measures stipulated in the declaration and the military agreement are executed smoothly. Presidential chief of staff Im Jong-seok said the government plans to ask the National Assembly for ratification only if some agreements reached by the two Koreas produce a financial burden. “As seen by previous cases, it’s unnecessary for Assembly approval to make the Pyongyang Declaration actually happen,” Im said after the Cabinet meeting. The ruling Democratic Party of Korea (DPK), the liberal opposition Party for Democracy and Peace (PDP), and the Justice Party welcomed the president’s ratification. On the other hand, conservative opposition parties criticized the move, claiming Moon was disregarding the National Assembly.